The Page 99 Test: David R. Montgomery's "The Rocks Don't Lie"
David R. Montgomery is a MacArthur Fellow and professor of geomorphology at the University of Washington. 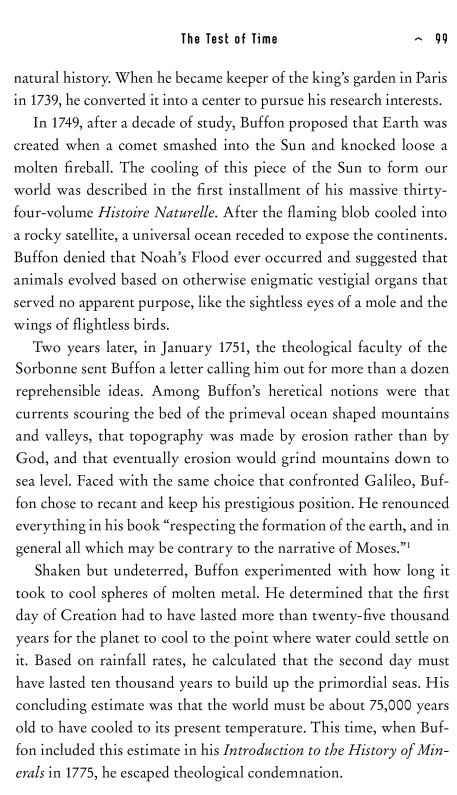 His latest book, The Rocks Don't Lie: A Geologist Investigates Noah's Flood, explores the relationship between science and religion through historical attempts to explain the biblical flood story, charting the influence of Noah's Flood on the development of geology, and of geological discoveries on the evolution of Christian theology and the birth of modern creationism. He is also the author of Dirt: The Erosion of Civilizations, and King of Fish: The Thousand-Year Run of Salmon. Baron Georges-Louis Leclerc [the focus of page 99, below left], Comte de Buffon and director of the king's botanical gardens in Paris was a curious man. 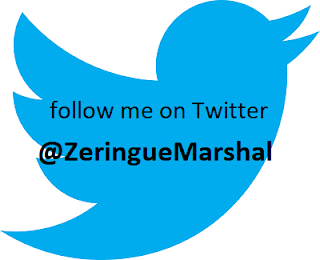 He proved a bit too curious for his own good when in 1749 he published heretical answers to questions about the origin of the world and its topography in the first volume of his landmark Histoire Naturelle. longer than Bishop Ussher's widely accepted, biblically-based 6,000-year estimate for the age of the world. And yet, when Buffon included this estimate in his 1775 Introduction to the History of Minerals he avoided theological censure. By then the clergy were beginning to argue among themselves as to the theological implications of geological discoveries that revealed Earth had a far longer and more complex history than told in the biblical stories of the Creation and Noah's Flood. At the dawn of the 19th century, theologians were accommodating geological discoveries by reinterpreting the six days of Creation as six geological ages, or by suggesting that geologic time could be stuffed into a gap of indeterminable length between the first two verses of Genesis. As I looked into the long history of interaction between faith and reason in interpreting stories of great floods I discovered that this back and forth between science and theology was not at all unusual. 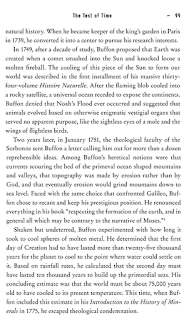 The story of Noah's Flood served as what might be considered the first geological theory and the theological response to geological discoveries set the stage for the rise of modern creationism. When you look into it, the real story of the historical relationship between science and religion is far richer than the long-running conflict portrayed in today's culture wars. Learn more about The Rocks Don't Lie at the W.W. Norton website.